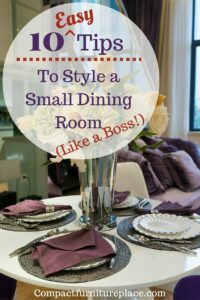 Let’s dish about small dining room ideas. (See what we did there?) How do you make a small space inviting enough to share a meal with friends and family, but practical enough that you can use it for homework, projects, work, or anything else? Here’s 10 design ideas to help you furnish and decorate your small dining room, and keep its functionality too. The links in this post take you to Amazon and if you buy something through a link, we get a small commission, at no extra cost to you. You can read our full disclosure here. We hope you enjoy our tips and product suggestions! A round dining table instead of a square or rectangular one works well in a small dining space. The shape makes the space appear larger simply because there are no sharp edges to maneuver around. Pair it with armless chairs for a less bulky look. Also, you can squeeze an extra chair or two in more easily. Benches are a great small dining room idea, especially if you have kids. You can squeeze a few on a bench like this one and get more seating without having to buy a larger table. Silly me, I thought they were just called benches, but apparently they’re banquettes (and this one is especially nice). Whatever you call them, they are one of the most stylish small dining room ideas out there. They add lots of extra seating in a small space and look great with any shaped table. Many of them are made with storage underneath too, which is a sweet bonus. Make your own banquette with this simple tutorial using this nifty and popular IKEA shelving unit. Like the banquette look but don’t have one and don’t want to make one? Use a loveseat, cushioned bench, or upholstered ottomans for that banquette feel. Put your dining table against a wall instead of in the middle of the dining area. You’ll appreciate the extra floor space for foot traffic when entertaining. Don’t use a bulky china cabinet or credenza, but hang open shelving instead. 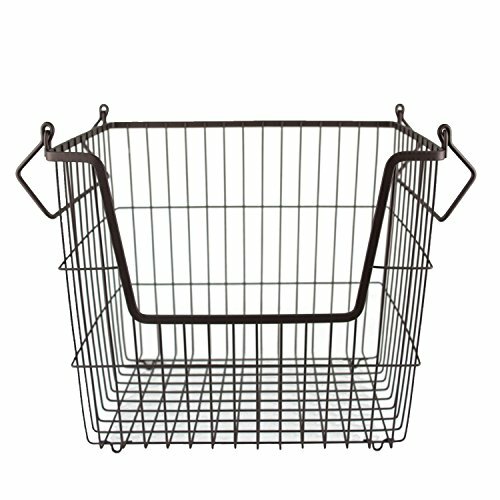 You can store and display pretty dishes and linens and use baskets or metal bins (similar to those in the picture) to store small things like napkins and placemats. Don’t want to make big holes in the wall? Just lean a large mirror on the floor – it gives the same effect. This idea is awesome for a small dining room/living room combo area. Place a narrow dining room table or sofa table behind the couch and add chairs or stools. If you need more seating for entertaining, keep some folding chairs stashed and just pull the table out so you can seat people on both sides. If you do that, make sure the table you choose is wide enough. Getting high has a whole new meaning with this small dining room idea. Hang your curtains from the ceiling instead of from the top of the window to visually expand the window and bring the eye up, which in turn expands the whole room. Compact dining tables that fold out to seat more people are classic small dining room ideas and a great solution for a small dining space. The beauty of these pieces is they come in a variety of shapes and sizes so you can really customize your space to suit many functions. So you see, no matter how small your dining room area is, there are lots of ways to make it beautiful and functional. For more small dining room ideas, follow our Pinterest board!